We want to learn how to build BegleBone capes and in this series of post we will be writing about our findings and how we built the NULLCape. You are right, that is the very minimum cape which actually does nothing. BUT..., WHAT IS A CAPE AFTER ALL? Good question. Yes, sure you already now, but just in case you are really, really new to the BeagleBone or you've got yours as a present you had never ever hear of it. A cape is just an expansion board for the BeagleBone. The BeagleBone provides two headers on its sides with lots of signals and interfaces, however you normally need something else to be able to attach your peripherals to this connectors. In the simpler case some wires and a platform to mechanically keep your peripheral and in the most complex case some support circuitry in order to do whatever you want to do. So, a cape is an expansion board for your BeagleBone the same than a extension board for your desktop computer (a graphics card or an audio card,...). In the same way that the boards you connect to your desktop computer have to follow some rules (size, connectors, pins they have to use in your motherboard bus), a Beaglebone cape also has to follow some rules, and this is what these articles are about. For starters we will have to read some documentation. Yes, you can probably follow this tutorial without reading the docs, but it is really an useful exercise as, documentation, is one of the strongest points of the BeagleBone... the official documentation is really high quality and professional. Just great. So, the starting point is the System Reference Manual (aka SRM). This is the document that described in full detail everything you will ever want to know about the board. There is another document also very interesting that describes the SoC (System On Chip) on the BeagleBone. This one is usually known as Technical Reference Manual (aka TRM). The most reliable source for the first document is BeagleBone Black circuitco wiki. The TRM is available from the Texas Instruments site. So, go to this link and grab the manual now! It might also be a good idea to also grab the BeagleBone schematics PDF and keep it nearby. Once you got the System Reference Manual, you should start reading it from the beginning. If you had not done it before you will learn quite a lot of interesting stuff. If you are a really impatient one, then go to "Chapter 8 - Cape Board Support" (looks like previous versions of the manual had this information on other chapters). Let's skip, for the time being, the eMMC and HDMI incompatibilities and move to Section "8.2 the EEPROM". That is the first thing we need to sort out. Well, actually it is not, but we think this is a great starting point. So what is this EEPROM thingy about?. Simple, that EEPROM is there because most of the pins in the expansion header were we are going to plug our cape may have different functions (that is called the pin's mux mode). Depending on what our cape will be designed to do we will need one function or another. However, these pin functions can only be configured from software so we need a way to let the software know which pins do we want to use. That's the main reason for the existence of this EEPROM. Additionally, it can be used to store additional data as calibration tables or any data that may be needed by the cape itself. In that very same section (8.2), a reference circuit on how to connect our memory is also shown. Basically we need a bunch of pull-up resistors and a capacitor. The DIP-Switch is optional and we will not need it right now. We will connect our memory address pins to a hard-wired address for our tests. So let's go ahead and mount our circuit. In our case we do not have 5.6K resistors so we also used 4.7K ones. Actually this 5.6K are selected in a way that when 4 capes are stacked the resistance seen by the I2C bus is 5.6 / 4 = 1.4K, so in principle any resistor value between 1.4K and 5.6K should work (as far as you do not stack any extra cape in). For our very first test we will set all the EEPROM address pins to 0. That configures the chip as an I2C device at address 0x50. This is not a valid address for a cape EEPROM as we will see in a while, but it is convenient for us right now. So here is our circuit. 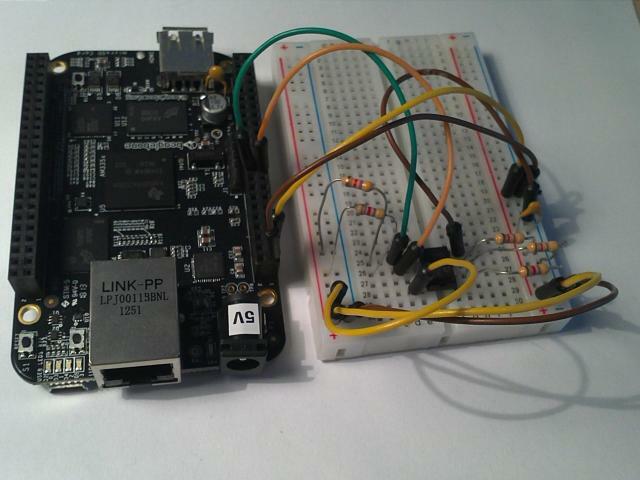 NULLCape: BeagleBone Black, I2C Serial EEPROM Test circuit. Now we can connect our circuit and power up our BeagleBone. Now we have to check if we can write in our brand new EEPROM. In principle we should be able to use i2cset and i2cdump for that, but those didn't worked well for us. So what we are going to do is use the EEPROM as it is meant to be used in our cape. So we are basically telling our kernel that the device on the i2c bus 1 sitting at address 0x50 is a 24c256 EEPROM. We can now check what has just happened. First we take a look to kernel log. We should see a couple of lines like these. No error there and the lines look OK. So now we have a neat eeprom field on our sys filesystem that, guess what?, can be used to write and read the contents on the EEPROM. Yep, an entry named eeprom which is actually the content of our memory chip. In principle you should be able to change this connections without switching the BBB off, however it is always safe to do that. If you do not want to shutdown the BeagleBone, at least disconnect your test board from the expansion connections and for sure, disconnect the power connections if you are really lazy like me. As usual, the author cannot assume any responsability in case your board is damaged or completely blows away. Everything described in this article worked OK for the author but if you decide to follow it, do it at your own risk. Accidents happens and we had already fried some boards playing with this. Let's run i2cdetect again and we will see that our device is no longer at address 0x50. If we check the sys filesystem we will see that the eeprom file is already there without running our instantiation code. What had happened? What happened is that the default BBB configuration reserves in advance the addresses 0x54 to 0x57 and pre-loads the at24 driver. Let's run the following command to check when that occurred. Here we can see the 4 instantiations of the at24 driver for the four reserved address, happening at the very beginning of the boot sequence (at second 0.25 aprox.). Now we can read whatever information we previously stored in our EEPROM. It will still be there (that's what an EEPROM is made for), but now at address 0x54. i try to built a cape with an integrated EEPROM to load the device tree overlays. My problem is that, the eeprom file and the driver folder for the device 1-0050 in /sys/bus/i2c/devices/1-0050/ are missing. I use a 24LC1025 instead a 24C256, can this cause the problem? It is a long time since I do not play with this. I had quickly checked the first pages of the interfaces and the two memories seems similar. However your model is not included in the list of memories supported by the driver (http://lxr.free-electrons.com/source/drivers/misc/eeprom/at24.c). So, if we assume that you can see your memory at 0x50 (with i2cdetect) and that when you instantiate your device nothing is mentioned in the log file, then, there are many chances that the memory cannot be used. Did you try to use a closer size memory on the instantiation? Unfortunately I do not have one of those memories to try myself. Thanks for the tutorial. But what's an SoC? The only meaning I know for that is "State of Charge", which makes no sense here. Maybe you could spell out the meaning of any acronyms the first time you use them, for newbies like me. Thanks. i try to build a LCD7 cape like one in 4D Systems company,but i didn't find there eeprom file contents to download it to my eeprom . if i had no eeprom in my LCD cape design, and connect my LCD cape to the BBB and open cap manager and echo the compiled device tree of my cap to the cape manager manually . will my LCD cape work ?? is the eeprom important for any function of my cape if i load my cape overlay manually to cape manager ? 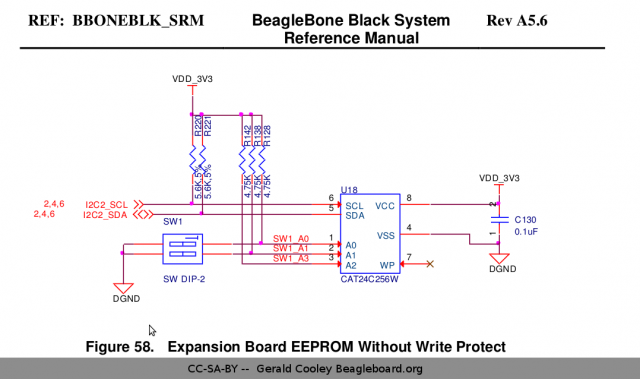 Generally speaking you do not need to add an EEPROM to connect anything to the BeagleBone. You just need to make sure that the used pins are configured as your board/cape expects. I had also noticed that there is no EEPROM dump available for any cape out there. That is pretty disappointing. However the content of the EEPROM only depends on you. The only relevant part as for today (and as far as I know) is the part number that is used to determine which device tree overlay needs to be loaded. "The one exception is proto boards intended for prototyping. They may or may not have an EEPROM on them." Despite of the interpretation of what a proto board, it can be infer that the EEPROM itself is a convention. Thanks for the valuable information, i was escaping from eeprom support for my capes. Now everything is clear for me. Esp. Linux tools and driver info was very important for me. Thanks a lot. I had added the links. Thanks for the good tip!